Hi folks! 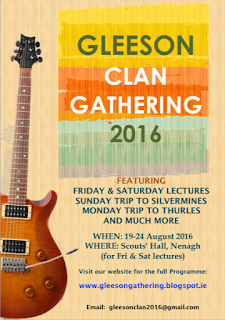 Help us get the word out about the Gleeson Clan Gathering 2016! 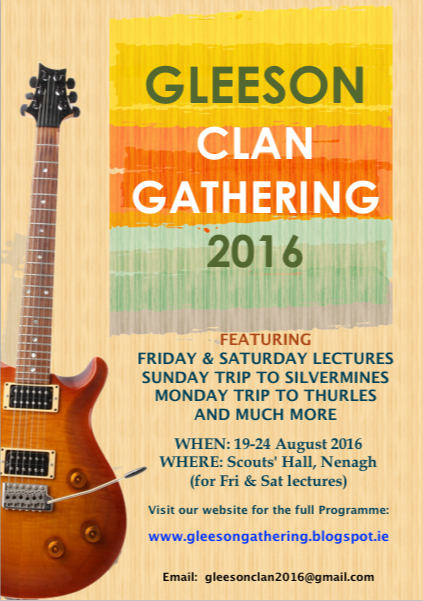 Contacting all the Gleeson's who would be interested in attending the Gathering is a mammoth task, but ... Many Hands make Light Work! And with your help we can reach every Gleeson in the world (potentially)! We have created a few publicity materials for the Gathering which you may find useful. There are a few brief announcements which could easily be cut and pasted into an email or a post on Facebook. We have several tweets for Twitter. And we have a few preliminary posters and flyers which can be printed out, put in shop windows, mailed to your maiden aunt, whatever you like really! 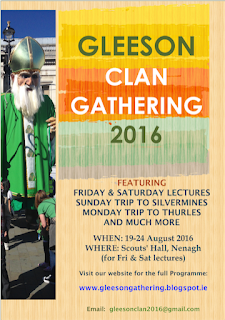 These can be found on the new dedicated Publicity Materials page on the website here - http://www.gleesongathering.blogspot.co.uk/p/publicity-materials.html … you will also find it at the bottom of the menu on the right. If you have other materials that you have developed yourself then please share them with me by emailing gleesonclan2016@gmail.com. Also, if you would like to volunteer for helping us in any way, I would love to hear from you.